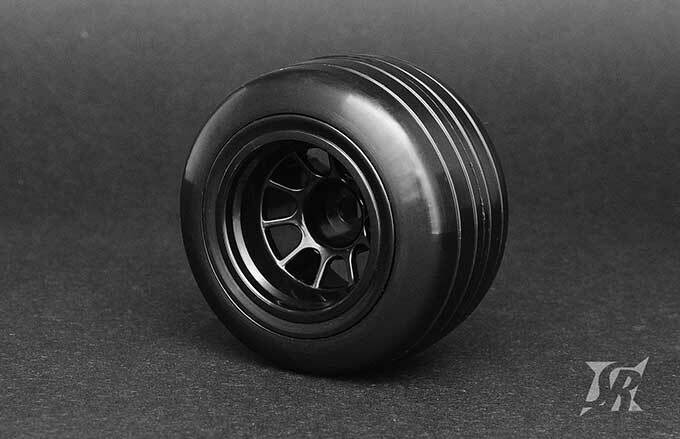 We are proud to introduced all-new V4 tires for 1/10th formula cars. The V4 tires are made for asphalt surfaces, Pre-glued on black color wheels with inserts and they fit most of today’s formula pan cars. Slick is best used on high grip tracks were it allows for smooth cornering and provides an overall easier driving feel while being also usable on damp asphalt surfaces. The grooved tires however are meant to excel in low grip asphalt conditions as well as on standing water or very wet tracks but also in dusty and greasy conditions. Rear 28 Deg: Made for all purpose condition. Hot, cold inside or outside. runs on any asphalt surface. Front 24 Deg: You will only need this set, if your looking for Maximum steering. Tuning tips:Clean the tires with our X1 cleaner (#0006), then prepare a run with Any of Sweep X traction compounds on rear of Sweep F1 tires first then start runs compound on front tires too inside half first, increase the amount of compounds until you have just right amount of steering for you.